Register for Race for the Cure and for every $50 raised, you’ll be entered to win! 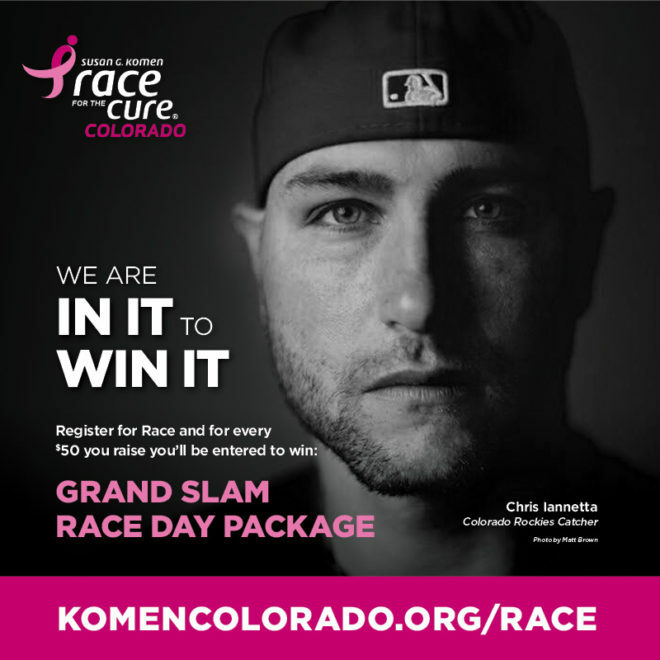 Thanks to the generosity of Chris Iannetta, Colorado Rockies catcher and co-founder of Jack Winery and The Denver ChopHouse & Brewery, one lucky person will walk off with a Grand Slam Race Day Package on Race Day, September 30. – Four tickets (behind home plate!) to the Colorado Rockies final home game of the season at 1:10 p.m.
One winner will be announced by Chris Iannetta live on Twitter at @Chris_Iannetta on Friday, Sept. 28 at 10 a.m. Follow @Chris_Iannetta to hear if you won! Please see the Komen Colorado Giveaway Terms and Conditions for full contest details.